U. QUEENSLAND (AUS) — Female giraffes won’t hang out with just anybody—like humans, they have what’s called a “fision-fusion” social system. Studying social relationships among female giraffes could provide essential information for the management and conservation of the species. Lead researcher Kerryn Carter of University of Queensland’s School of Biological Sciences observed the social groupings of 535 individually identified wild giraffes in Etosha National Park in Namibia. The 14-month study discovered that giraffes have more complex relationships and social networks than previously thought, and this is of importance to understanding the evolution of animal and human sociality. Carter looked at the frequency at which each giraffe pair associated, while taking into account how much their home ranges overlapped, and thus their ability to meet on a regular basis. 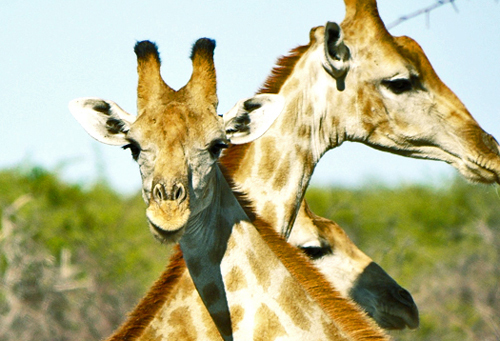 “We found, rather than females interacting non-selectively as previously thought, individual female giraffes preferred to be in groups with particular females and avoided others,” says Carter, whose findings appear in the journal Animal Behaviour. Females’ individual social preferences, their ages, and their reproductive states may contribute to their choices of female associates. Research is continuing on to understand which factors contribute to these preferences. Knowledge about the patterns of social networks in species such as giraffes helps us understand how diseases may spread through a population and how individuals may learn about their environments from one another. This understanding is therefore important for conservation. Such preferred and avoided relationships have been documented in other fission-fusion taxa such as eastern grey kangaroos, bottlenose dolphins, northern long-eared myotis bats, and of course humans. “These similarities in the social systems of these varied species are surprising given how much the ecology of these species differs,” says Carter.